Imagine a shortbread-like cookie, enriched with egg yolks and the popcorn-like flavor and odor of toasted pine nuts, except instead of using all wheat flour, it features a mixed-corn, stone-ground cornmeal. 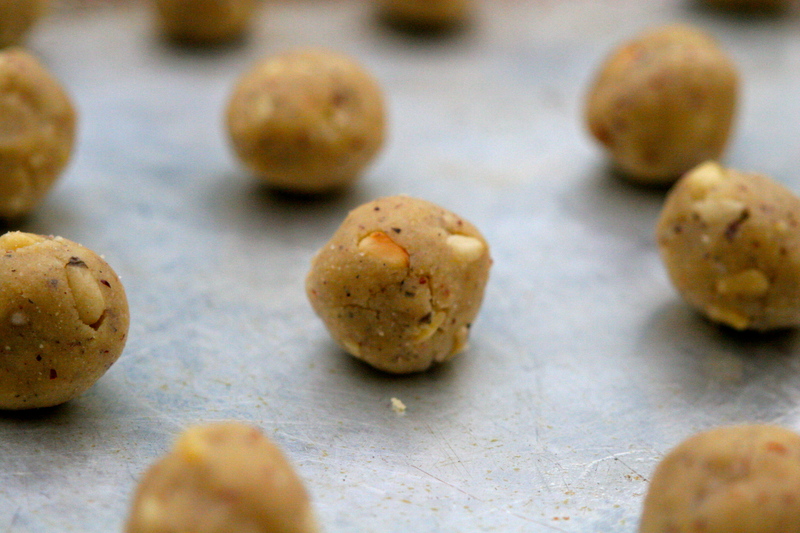 This cookie knocks your socks off with its playful, earthy, not-too-sweet flavors. If you like the sweet and homey flavor of corn and you love pine nuts, this is your cookie my friend. My epicurean uncle’s equally talented partner hosts a cookie party each year where she makes at least a dozen types of superlative little cookies. 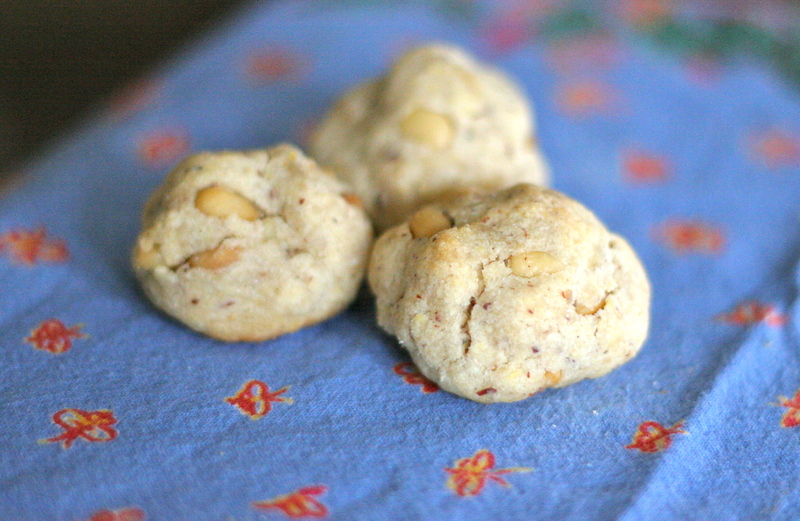 I loved her little yellow cornmeal cookies so much that she gave me the recipe that inspired her creations. In turn, I have morphed it into a cookie that suits my tastes and fanaticisms. And now I share it with you too. 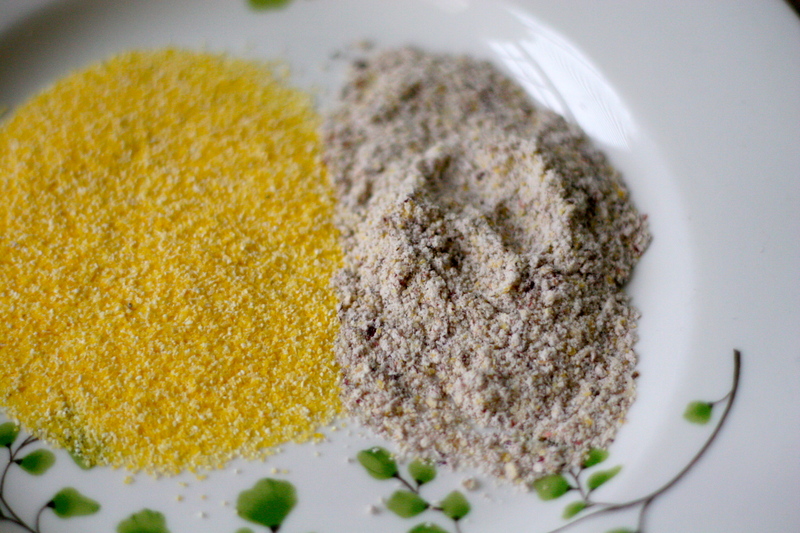 Cornmeal comparison--look at the yellow, white, red, and purple in Full Belly Farm's! 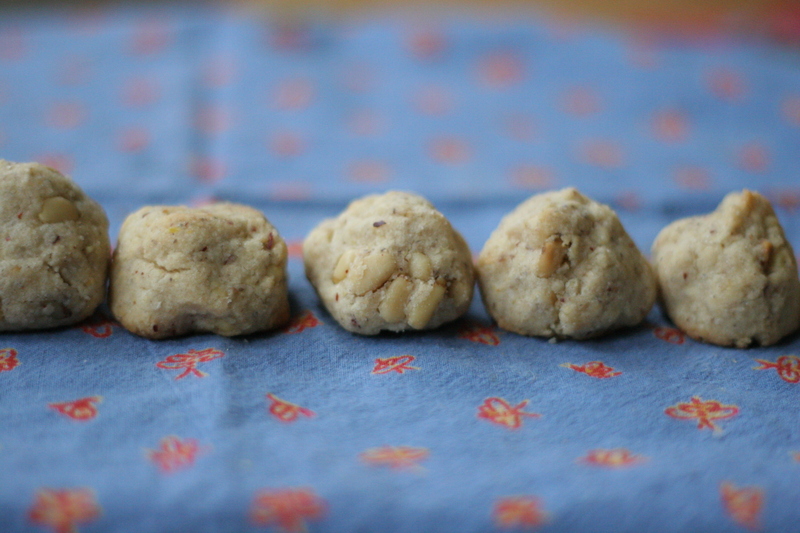 More cornmeal pine-nut cookies in a row. And did I mention that, if you are the type of person who eats cookie dough (like myself who keeps several containers of chocolate chip cookie dough in the fridge and freezer at all times), that the dough is equally addictive? It is. I usually cook just half of the dough and save the rest. Finally, if you have made any of the meringues or macarons I posted in the last week or so, this is a terrific way to use up your egg yolks. If you wish to experiment with the flavors of the cookie, and you like a busier flavor palette, I have a few suggestions. First, if you want to go a bit Mexican with the cookie, much like Chocolate with Chilies or Jalapeño Cornbread, these cookies would taste really neat with a crack of fresh pepper or a dash of spicy dried chili powder—just a mysterious dash. Another seemingly strange, but tasty combination is a tiny dash of cumin powder, which also causes the cookie to teeter between a savory and sweet biscuit. Finally, I love sweet corn desserts with a little orange zest incorporated in or a little bit of coconut. As for the sugar recommendations, this is up to you. If you like the molasses-like flavor of raw sugar and, again, want to be Mexican in your flavors, go for either the demerara sugar or the pilocillo. 1. Preheat the oven to 350F degrees. In a mixer beat the butter on medium for one minute and add sugar, beating until it is fluffy. Add egg yolks, salt, and vanilla until just incorporated. Add cornmeal until it is a thick dough and let it rest for 2 minutes. 3. 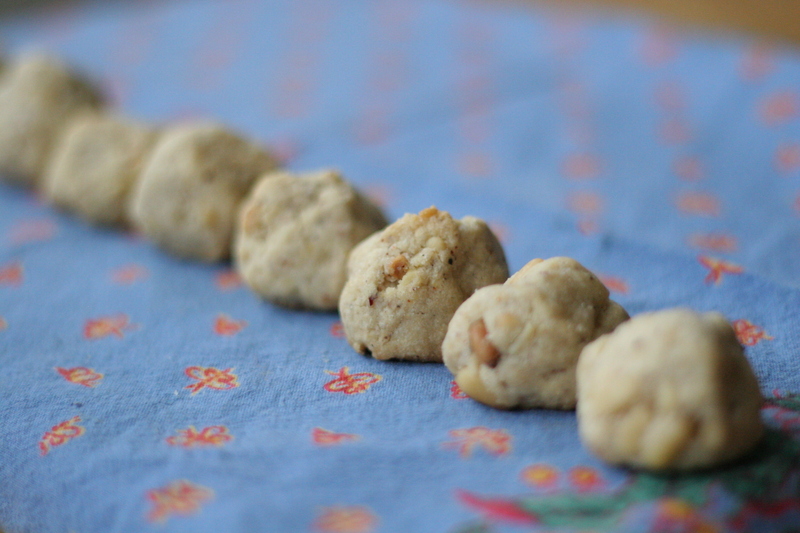 Roll tiny balls, about ¾-1 inch and press down lightly on the top of each one. They do not expand too much so you can place them pretty close together. 4. Bake for 10-12 minutes (turning the pan front to back halfway through the cooking time) or until the edges just begin to turn golden. Let cool and enjoy. This entry was posted in Cookies, Whole Grains and tagged Cornmeal pinenut cookie recipe, Full Belly Farm Cornmeal, Mexican cornmeal cookie recipe, stoneground corn recipe. Bookmark the permalink. AM, Hands down you are the coolest chick I know. Found your blog after Dan G. told me about it. EVEN DUDES READ YOUR BLOG!!! You are totally rocking the food thing. B.R.A.V.A.!! Thanks Sandra. This has been so much fun to do. I hope you enjoy it.